Asteroids and meteors: Why are we suddenly seeing so many? Why Are We Suddenly Getting Hit By So Many Space Rocks? 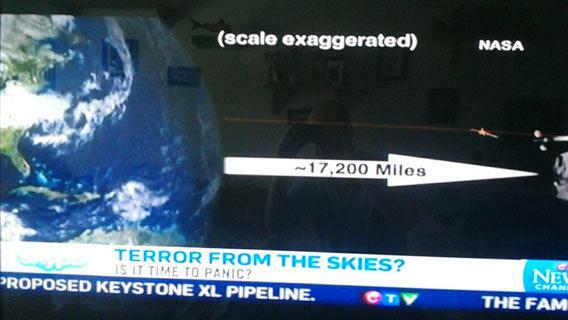 Image credit: Not An Exact Science Show, used by permission. At least, that’s what I’m hearing on the news and on social media. A lot of people are scared about asteroid impacts right now, and it’s hard to blame them. When you have a near-miss by an asteroid the size of an office building just hours after a monster meteor rocks Russia which happened just a day before a fireball blazed over California which was just days after reports of a similar event over Cuba…well, it really does seem like the Universe is trying to kill us. Are we under attack? Are all these rocks from the skies related? In a word: nope. It’s coincidence. No, really! Of all the things I’ve been explaining since the Chelyabinsk meteor on Friday, this is the one that people have the hardest time with. I completely sympathize; you can go your whole life without hearing about a major meteor event, and then to get so many at the same time…the feeling that they must be related is overwhelming. A lot of that is due to human nature. Our brains love to connect events that happen around the same time, even if they’re unrelated. The proper name for this is post hoc, ergo propter hoc, which means “after this, therefore because of this”. In other words, something happens, then something else happens, and we think the two are related. You find a penny on the ground, and then you meet the love of your life. It’s a lucky penny! Or it’s a coincidence, and your brain links them together. Not only that, but another known human trait is to be more aware of an event once one happens. Buy a car, and suddenly you see that model everywhere on the road. Same thing here: We had two big asteroid stories, so people were thinking about it. Then a bright fireball was reported over the San Francisco Bay area, and people freaked. 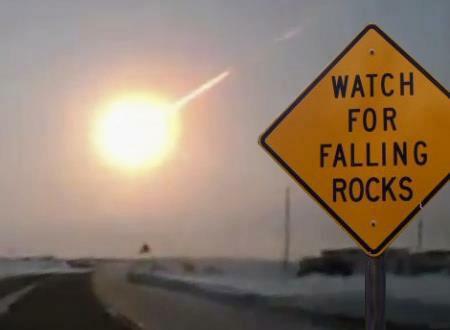 But really, bright meteors like that happen all the time. It’s rare that a week or two goes by that I don’t hear about one someplace, and the web is filled with videos of them. OK, fine, we know the psychology of this. But big meteors are rare. How can the Russian meteor and the near-Earth asteroid not be related? On Friday, Feb. 15, 2013, the asteroid 2012 DA14 approached the Earth, gliding just 27,000 kilometers (17,000 miles) above our planet’s surface. While it wasn’t the closest pass of all time (the Russian meteor got a wee bit closer), it was the closest a rock of that size has ever gotten of which we’ve been aware beforehand. It was a tight squeeze, and media were paying attention. DA14 was small as asteroids go, but an impact by a 50 meter asteroid like DA14 would be like detonating 20 million tons of TNT on the Earth. That’s no dinosaur-killer, but it’s not something you want to happen randomly someplace on Earth. I was all ready to talk about it in a live video chat as it passed, but then something else caught my attention. The rock that came in over Russia was probably 17 meters across—the size of a house—and had a mass of about 7,000 – 10,000 tons. It was moving many times faster than a rifle bullet, and thus had a lot of kinetic energy—the energy of motion. Slowed by the Earth’s atmosphere, it released that energy as a series of explosions that totaled something like 30,000 – 500,000 tons of TNT, roughly the yield of a small nuclear weapon. It was so huge and bright it was seen for hundreds of kilometers. Russians commonly have video cameras on their dashboards, so videos of the event popped up on the internet within minutes. The videos of the blast wave from the explosion are terrifying, and hundreds of people were injured by shattered glass from windows. Within hours, a hole 8-9 meters (30 feet) across was found in the surface of a frozen lake west of Chelyabinsk, presumably where a large fragment (if not the main mass) of the meteoroid fell to Earth. 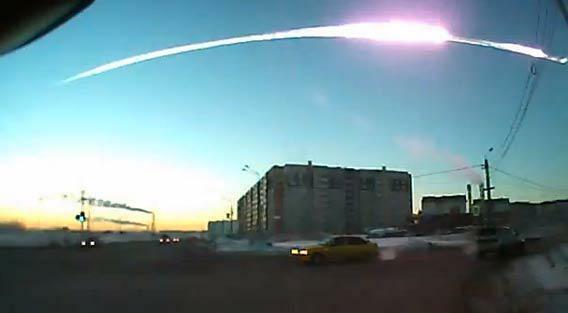 Still frame from a dashboard camera of the great Russian meteor on Feb. 15, 2013. Clearly, the world was paying attention. 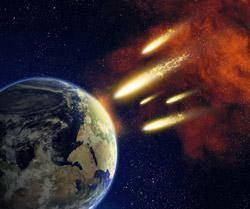 A ginormous meteor impact just 16 hours before a near-miss by an even larger asteroid? They must be related! Except they weren’t. I have a strong feeling some Hollywood movies are behind this idea; every asteroid impact movie (and I’m looking at you, “Armageddon”) shows lots of smaller pieces floating near the main rock, and they always have lots of smaller Earth impacts (and always hitting major landmarks in cities) happening days before hand. Picture the Earth in space, moving around the Sun. For an asteroid to impact us, its orbit has to exactly intersect ours, and, not only that, both objects have to be there at the same time. Our planet is big, nearly 13,000 kilometers (8000 miles) across, but as it orbits the Sun it’s moving fast—30 kilometers per second (18 miles per second). That means it moves through its own diameter in just seven minutes. The Russian meteor happened 16 hours before the passing of DA14. In that time, the Earth moved 1.7 million kilometers (1 million miles), which is a long way. That right there makes it very likely the two events are unrelated. If you’re driving down the road and see a piece of tumbleweed, and then 16 hours later see another one, what are the odds they’re from the same plant? But there’s more. It is possible some asteroids might have debris fields around them, but those smaller attendant rocks would be moving on very nearly the same orbital paths as the main one. Some might be ahead, some behind. You can imagine them as beads on a string. 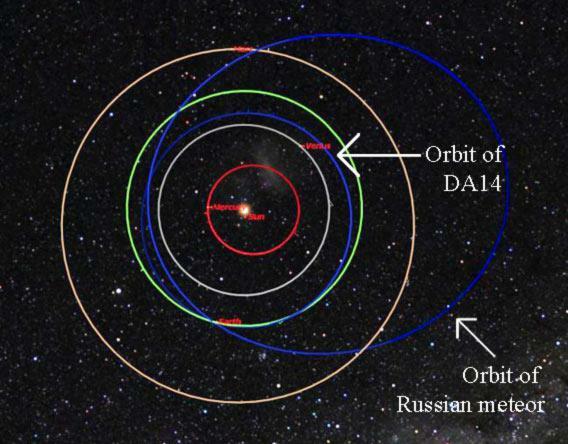 The inner solar system, with the orbits of 2012 DA14 and the Russian meteor in blue. It’s a lot like two roads intersecting, one going over the other using an overpass. All day long, cars are driving on both roads, but every now and again one car will pass directly over another. At that moment both cars are in the same spot over the Earth’s surface. Neither car is related to the other: One may be on one road heading east, the other on the other road headed north. They came from different places, and they have different destinations, but happen to cross at the same time. It’s a coincidence these two cars happen to be at the same place at the same time, but it’s inevitable that some two cars would do this during the day. Close, but not quite up to scientific snuff. So it is with asteroids. There are rocks out there orbiting the Sun every which-way, unrelated. Every now and again, we get two of them at the same place at the same time (or within a few days of each other) and that happens to be where the Earth is, too. Coincidence. Add in the fact that humans tend to notice unusual things—especially ones that have a special way of getting our attention—and that we also tend to correlate two different events if they happen at or near the same time, and voilà: The Sky Is Falling Syndrome. To be sure, on any given day the odds of two big events like this happening within a day of each other are low, but they’re not zero. And given time, the chance becomes a certainty. In science, there’s an event called a stochastic process. It happens when you have a system that follows a set of rules, but there’s a random nature to it as well, making it hard to predict exactly how things will turn out. Flip a coin 10,000 times and there’s no way I can tell you what each flip will be, but I can be very confident you’ll get close to 5000 heads and 5000 tails. Asteroid impacts are a stochastic process. We know that a near pass by something the size of DA14 only happens once every 40 years. On average. We know something the size of the Chelyabinsk rock hits us once every century. On average. We know a fireball like those seen over California and Cuba happen once a week or so. On average. No, it’s time to think carefully and logically. As it always is. Another big impact like Chelyabinsk may not occur again for 500 years, or another may come in tonight. There are billions of such rocks in space, and they are simply too small and faint to track. We can only talk about them statistically. The same is true, more or less, with DA14-sized rocks as well, but most likely there are a million or so of them, with 10,000 having been spotted. That’s 1 percent. When people think asteroid impacts, they think dinosaur killers. But we have most of the 10-km asteroids mapped out, and we know we’re pretty safe from them. But watch those videos from Russia again, and remember that a rock smaller than an average hill did that. We need to take this threat seriously. Congress has called for an investigation into the issue, and I applaud that. I hope something comes out of it. Specifically, cash for NASA, cash for observatories, and cash for private endeavors to build more telescopes, to launch space missions, and to map the volume of space around the Earth’s orbit where these rocks lurk. While I don’t lie awake at night in fear of this, I also know that if we wait long enough doing nothing, something the size of Chelyabinsk will hit us again, or it might be bigger. Or it might be made of metal and survive entry into our atmosphere, dumping its megaton of energy into a city instead of high in the atmosphere. As science fiction author Larry Niven said, dinosaurs aren’t around because they didn’t have a space program. We do. Now we just have to be intelligent enough to fund it, and to use it.